I just received my Wedding Planner which I ordered last week from Angus&Robertson's and I am so thrilled about it that I wanted to share with you my review. The Wedding Planner can be found (Australian Site) here or Amazon.com has them too. I purchased mine for $24.99 including shipping, and honestly I definitely believe it is worth every dollar spent. It's not overwhelming, and if you're like myself and mostly planning a wedding by yourself then this book is like your new best book friend.. The tabs are all relevant and nicely broken up into their own sections, everything just flows nicely in this book and not once did I have to take a moment and be like HOT DAMN, I'M LOST! Each section has its cover-page decorated with graphics that although simple, really give a nice vibe within the whole book. This planner covers everything, and then allows you to add in your own notes, inspiration and much more within its pages. Honestly this book would help someone who may feel overwhelmed with all the decisions that come with planning a wedding. There is adequate space to write in details in, which may sound like a small thing but when your using a planner to write things in (which I assume is the purpose of many, if not all planners) then you really do want to have adequate writing space. I am planning on doing a few pages a week, making the whole process as stress free as I possibly can. The layout and design of the book is very calm (if that makes sense) and everything seems to lead on perfectly from the last paragraph you read. 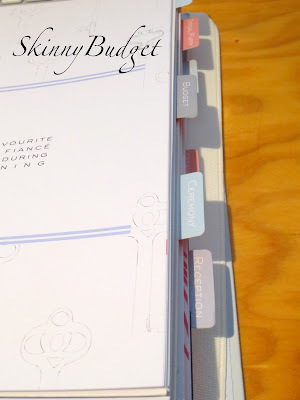 I would definitely recommend this to any bride-to-be, and for me being that this planner is a hard cover binder... It gets my vote! What Planner do you use/ what system are you using to plan your wedding?